Thank you, Jonathan. Before the break, we met our contestants, Susan and Meredith. Our next game is about girl bosses or, as I like to call them, bosses. EISENBERG: Susan, there is a photo of you and your husband that hangs in match.com's headquarters in London. SUSAN GROSS: This is true. EISENBERG: Is it to remind them that it was a success or a failure? GROSS: (Laughter) A success. Yes. GROSS: We made the wall. EISENBERG: Inspiration. Give us the story. GROSS: We met nine years ago. So yeah. EISENBERG: It's a popular number tonight. GROSS: He was in England. GROSS: So then I wrote match.com, and I was, like, what do we do now? Like, you made this possible, right? EISENBERG: Yeah. Pay for our wedding. MEREDITH PALUSCI: There you go. EISENBERG: That's amazing. Meredith, our next game is about bosses. When's the last time you did something like a boss? PALUSCI: I honestly feel like a boss every day I go to work. I - you know, just the other day - this is, like, a daily occurrence for us and all my amazing co-workers - we did some high-quality CPR on a gentleman. We saved his life. And it's pretty awesome to get on someone's chest and bring him back to life. It's awesome. EISENBERG: OK. This is a music parody game called #Girlbosses. Susan, stay in the lead, and you go to the final round. Meredith, you need to get more points or you have to pay to see Bruce Springsteen on Broadway. The cheapest ticket is $797. EISENBERG: So you'd better ask your boss for a raise. 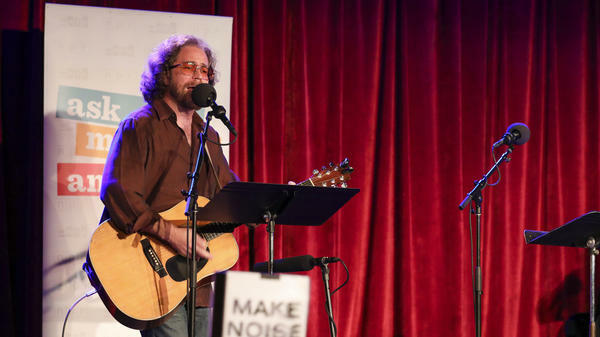 COULTON: We rewrote songs by the boss Bruce Springsteen to be about notable women in the business world. So just ring in and tell me who I'm singing about. And if you get that right, you can earn a bonus point by telling me the original song title. Here we go. (Singing) I know a gal has a lifestyle magazine about making things look pretty. In 2004, she was briefly in prison. Her nickname in jail was M-Diddy. COULTON: Martha Stewart is who is we're looking for. Yeah, that's right. COULTON: For a bonus point, can you name the original song? PALUSCI: Bruce Springsteen is not my jam, unfortunately. I don't know the name of the song. COULTON: That was "Glory Days." Here's your next one. (Singing) Born down in a Grecian town. Ran a blog, it was well-renowned. Lot of click-bait, but what the hell? Then she sold it all to AOL. COULTON: Yeah, that's right. Huffington Post. COULTON: For a bonus point, can you name the song? PALUSCI: I do feel bad. COULTON: ..."Born In The U.S.A."
EISENBERG: Who knew AOL had enough money to buy the Huffington Post? COULTON: Send CDs out all the time. EISENBERG: ...Press and send CDs - yeah - with all that saved money. Huffington Post. COULTON: Here we go. (Singing) She left HP, and she thought she could be a real presidential candidate. But then Fox put her in the second tier of the Republican debate. COULTON: No, I'm sorry. That is incorrect. Meredith, do you know the answer? PALUSCI: Are we talking about Sarah Palin? COULTON: No, I'm sorry. It's not Sarah Palin. We're looking for Carly Fiorina. COULTON: They chew them up, and they spit them out. EISENBERG: I know. It's, like, you are built for politics if you spent the earlier part of your career screwing people over toner prices or something like that. COULTON: I guess that's right. And that was "Born To Run," of course. Here we go. Here's your next one. (Singing) Palo Alto was a cookie shop, and the franchises multiplied like they'd never stop. You could end up with a bellyache if you eat her giant cookie that's the size of a cake. COULTON: Mrs. Fields - Debbi Fields. We'll accept Mrs. Fields. COULTON: For a bonus point, can you name the song, Susan? GROSS: I know it, but I can't remember the tune now, what you just played. COULTON: I'm a very forgettable musician. That's why I have this job. COULTON: That was called "Hungry Heart." COULTON: Yes. OK, here we go. (Singing) She started out as a model on a Sports Illustrated page. Licensed her brand to Kmart. Her home goods are all the rage. COULTON: Yeah. Quick on the buzzer, well done. COULTON: For a bonus point, can you get a - no, no, no. GROSS: And I love Bruce Springsteen. My mother's going to be very disappointed. She's a big fan. COULTON: Well, you can just tell her you weren't on the show, and she won't even notice. COULTON: That was called "The River." (Singing) A fashion icon, editor at Vogue, haircut like Joan of Arc, "The Devil Wears Prada" is her. COULTON: Yeah, that's right. You got it. EISENBERG: I hate to point this out once again. But this is about girl bosses. If "The Devil Wears Prada" was about a man, it would be called "That Successful Good Looking Guy Wears Prada." COULTON: "The Businessman Wears Prada." COULTON: Susan, I have to ask. GROSS: No, it's not coming to me. COULTON: It's called "Tougher Than The Rest." All right, this is your last clue. (Singing) She said lean in. Lean in. Lean in. Please don't say bossy. It's bad for girls. She gives TED talks. She wrote some books. She's helping Facebook destroy the world. COULTON: Sheryl Sandberg is correct. COULTON: Can you - no. PALUSCI: Jonathan, I'm so sorry. COULTON: It doesn't bother me in the least. That's called "For You." Ophira Eisenberg, how did our contestants do in this game? EISENBERG: They did fantastic. They don't know Bruce Springsteen. EISENBERG: Yeah, we both are OK with that. EISENBERG: All right, well, after two games, congratulations, Susan. You are moving onto the final round.